Heartily welcome to Land of Lord Buddha’s birth place. Nepal has several holy and some of the most sacred and pilgrimage sites such as Lumbini, where Lord Buddha was born as a price before 6th century BC. Gotihawa and Niglihawa where respectively Krakuchanda Buddha and Kanakmuni Buddhas were born. Kathmandu valley also know as the city of temples has of the most important Buddhist sites including Swayambunath, Boudhanath stups, Kapan Monastery, Pharping and Namo Buddha where Buddha had chopped his own body and fed a hungry tigress according to ancient mythology. Join our 15 days Buddhist Culture Tour including the birthplace of Buddha - Lumbini. 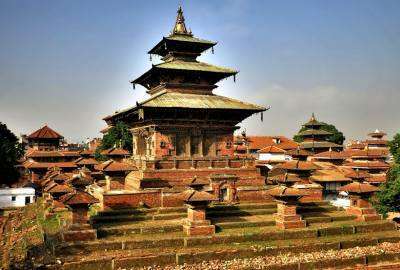 The tour combines both the natural and cultural aspects of touring in Nepal, starting from Kathmandu: the cultural, historical and political center of Nepal. Kathmandu has its own brand of cultural life which is based on unique mixture different religions and faiths. In Kathmandu, we visit Boudhanath, Swoyambhunath, and many other important Buddhist monasteries. Then we drive further southwest to the birthplace of Buddha, Lumbini. Devoting one full day in discovering the various cultural and spiritual sites at Lumbini, Pokhara - the adventure capital of Nepal. In Pokhara, along with some natural sites, we pay our visit to the World Peace Stupa and the Tibetan Regugee Center to get a firsthand experience of the Tibetan Buddhism lifestyle. Then we drive back to Kathmandu for the return flight. Day 01 :Welcome to Kathmandu Welcome to Kathmandu, introductions and pick you from airport then transfer to hotel in Kathmandu. Welcome drink and a short brief about the trip. Day 02 :Bouddhanath Visit to Bouddhanath including the main stupa and to the monasteries which surround this most sacred area. Be one of the thousands who circumbulate the stupa with the idea of becoming enlightened to benefit all beings and see the monks as they go about their daily practices in Boudhanath. Then our tour leader introduces in the Kopan Monastery. Stay overnight in Hotel. Day 03 :Namo Buddh to Dhulikhel or Nagarkot Visit to Namo Buddha, the famous Buddhist Pilgrimage site where The Lord Buddha sacrificed his body to hungry Tigress and its Cubs eons ago. We can visit the Monasteries and surroundings holy site then drive back to Dhulikhel or Nagarkot by private vehicle (if you are interested we can stay overnight in the monastery lodge in Namo Buddha, eat and drink with the monks). Stay overnight in Hotel. Day 04 :Dhulikhel or Nagarkot to Kathmandu Seeing and paying homage to the majestic Himalayas from a Dhulikhel or Nagarkot from viewing point by opening up to receive what these mountains have to offer us we can be cleansed and nourished on our pathway forwards to Pharping where Guru Rimpoche (Padmashambhava, known a the Lotus Born Buddha) meditated and whilst driving back to Kathmandu we visit 2000 years old Swayambhunath stupa. Stay overnight in Hotel. Day 05 :Drive to Lumbini Drive to Lumbini - The Sacred land and ‘The Birth Place of Lord Buddha’ the holy site of His Holiness Maha Sambodhi Dharma Sangha, famously known as the ‘Buddha Boy’ deeply loving vibration of Buddhism. Let us hear about the amazing stories of this most blessed Guru and the idea of us moving towards a Golden Age. Day 06 :Visit to Maya Devi Temple Visit to Maya Devi Temple to see the actual birthplace of Sakyamuni Buddha. Here we will also be offering attunements as this is such a significant spiritual site! We will also visit some of the closer monasteries around Maya Devi Temple as we meander and move through this deeply sacred land. Overnight in Hotel. Day 07 :Lumbini We take a tour of the surrounding areas of Lumbini to look at some of the ruins dating back centuries including some which are believed to be the remains of the Palace where the Buddha grew up. Let us understand more about the history of Lumbini. Overnight in Hotel. Day 08 :Drive to Pokhara from Lumbini Drive to Pokhara from Lumbini through the hills and great landscape scenery. We will be staying in one of the finest hotel in Pokhara. Overnight in Hotel. Day 09 :Pokhara This is a free and relaxing day to enjoy the many options available in Pokhara. Pokhara is famous for its leisurely lakeside, blessed with natural beauty offers breathtaking Himalayan panorama in the north and beautiful lakes in the city. Its many shops, boutiques, cafes, restaurants, bars and natural beauty make this a truly wonderful place to enjoy a wide range of energies and activities. Overnight in Hotel. Day 10 :Sarangkot Drive to Sarangkot where we sleep at the altitude of 1,500m high from sea level. Beautiful views from Sarankot are: beautiful nightlight over Pokhara, amazing sunrise view, Annapurna Himalayan scenery which is 55km long massive includes 13 peak above 7000m and other 16 additional peaks over 6000m that includes Annapurna I (8091m), Dhaulagiri (8167m). There may be a bit of a climb up the stairs but the views are definitely worth it! And we visit Davis Falls, Gupteswhor Cave, Seti Gorge etc. Day 11 :Pokhara After breakfast, walk up to the Pokhara Peace Pagoda - sitting high above the lake and in full view of the snow capped mountains, views over the Himalayas do not come much better than this. You then have another free afternoon to explore the many activities here in Pokhara. Day 12 :Drive to Kathmandu Drive to Kathmandu which some 200km and takes about 6-7 hours by Toursit coach. We can enjoy the beautiful terraced rice-fields, and full mountain view of Annapurna Range, Manaslu, Ganesh Himal whilst driving way back to Kathmandu. Overnight in Hotel. Day 13 :Budhanilkantha As optional trip, we can drive to Budhanilkantha and walk up to visit Nagi Gumpa (nunnery) and walk down to Fulhari and Kapan monastery again for the opportunity of visiting a working monastery with other like minded people studying the philosophies and rituals of Tibetan Buddhism - this is Kopan Monastery and we hope you enjoy it as much as we have. Day 14 :shopping Last hours shopping in main tourist hub of Thamel for dear ones back home. We will be finishing the tour with a nice evening together to say farewell. Day 15 :Fly back to home land We will drop you off to the airport and wish you a safe journey back home and wish to see you again.